The Gangjeong International Team (savejejunow.org) has issued a signature campaign to stop the military exercises and show (International Flight Review) that are expected to be held on October 10th, 2018 on Juju Island off the coast of South Korea. This is the biggest event by the Korean navy since Jeju naval base was constructed, and around 50 warships and 20 aircraft from 45 countries will gather in Jeju Naval Base (including a U.S. nuclear aircraft carrier). Grassroots activists note that this event “will heighten the military tension in the region and create dark clouds of conflict in the midst of the growing desire to open a new era of peace and coexistence and end the war on the Korean peninsula and Northeast Asia”. 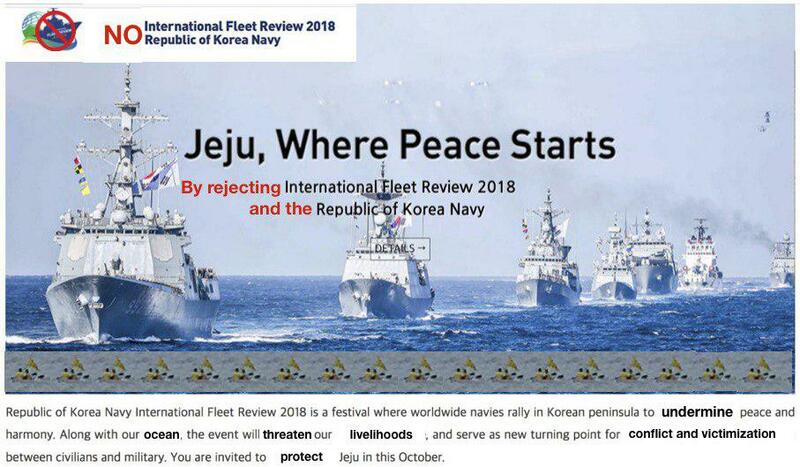 In July 2018, Sung-hee Choi of the Gangjeong village international team wrote in Karibu’s newsletter Voices from the South,that “if we want real peace, all war exercises should be permanently stopped and we need to end the militarization of the region,” citing this international fleet review. Signatures for the campaign will be collected until 6pm (GMT +9, South Korea time) on October 9th, before being published October 10th. Karibu will be hosting the Norwegian premiere of the film “Village vs. Empire,” that chronicles the stories of the grassroots activists on Jeju against the military project on the island, on Saturday, 13th October at 16:00 in Oslo. More information can be found here.